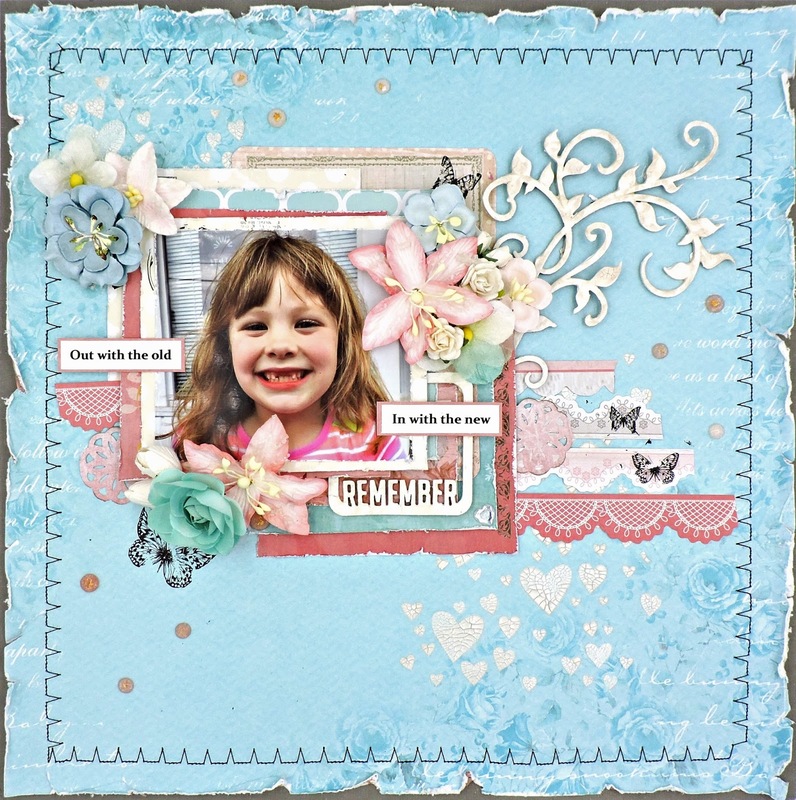 The theme of this month's Swirlydoos Round Robin challenge is "New Beginnings". Ginny Hickmont led our team with a layout featuring her daughter's life post tonsillectomy and Bec Genet followed with the best possible "beginning": her newborn son. I had been scratching my head, trying to come up with something, when I remembered my Granddaughter's loss of baby teeth and the beginning of her permanent teeth last Summer. I've used a bit of a variety of papers and embellishments on this page: a sheet of the LemonCraft pattern paper that was included in the January "Delicate" kit, scrap papers and stickers from the Kaisercraft Silver Bells collection from December 2015 kit and embellishments from my stash. Ginny's faux stitching around her borders reminded me that I've been neglecting my sewing machine, so after rough distressing the edges of my pattern paper and adhering it to a cardstock base, I created a frame with black thread using a decorative stitch. Again following Ginny's design, I stenciled some scattered hearts with the Memory Box Heart Confetti stencil and Prima Platinum Crackle texture paste. While that was drying, I gave my chipboard embellishments (Creative Embellishments' Flourish 15 and from Rae Moses, a pretty "Remember" frame) a base coat of gesso and then a thick coating of the same texture paste. To build a background for my photo, I cut up some of the Silver Bells scraps into varied sizes, added a couple of Prima journaling cards, lightly distressed the edges and applied some rub-ons from a partly used package in my stash. Next, I played around with the pieces until I was satisfied with the design. I stapled them together in the middle and glued it all to the page. After I matted the photo with one more scrap, I glued on some packaging to give it dimension and adhered it to the background. After placing some stickers and a couple of punched pieces on either side of the photo, I scattered the remaining rub-ons (all butterflies) here and there around the page. I tucked the frame chipboard piece under the photo and the flourish down the side and added flowers, basically combining Ginny's and Bec's designs. The title was printed out on plain cardstock and matted with bits of scraps. To finish my page, I scattered a few Prima gems around and added a mirrored heart to the corner under the chipboard.